I have been tweeting for several years now and have found twitter immensely useful for better understanding of markets. I can’t recall how many times I found useful and actionable views here. Similarly, just bouncing the ideas off people on Twitter has saved me a lot of money by avoiding stupid decisions. Having spent my career on both sell-side and buy-side I have been observing how the discussions about markets change. Therefore, I was very pleased when I found out about PremoSocial. And when the good guys from Bespoke asked me to join, I was more than happy to try it out and so here it is: @BarnejekPremium. This account will be discussing mostly Emerging Markets matters across asset classes. Granted, these days many developed countries are behaving like old-school EMs so you can count on an occasional discussion of Brexit, Grexit, Trumpxit etc. but the bread-and-butter of this feed will be emerging views and trends. Importantly, I am hoping to get a lot of interesting discussions going. Also, I will leave all the “clever puns” and sarcastic comments to the open @Barnejek handle. How to become a part of it? It’s very simple. You just need to subscribe at my @BarnejekPremium page on Premo and you’re good to go (importantly, you can unsubscribe anytime!). I have been posting some stuff there lately, which hopefully will give you a flavour of what to expect. I have set the subscription at 10$ per month, which is where I think the Premo market is starting and we’ll see where it gets us. It goes without saying that both replies to tweets and DMs will be welcome and I will strive to answer promptly and to the best of my ability. I think this is one of the most exciting ideas in the “FinTweet” sphere in recent times and I am very happy to be a part of it right from the start (also, I am told I am the first user content provider outside of the US). I hope you give it a go, not just for me but for the gurus like Josh Brown and Mark Dow too! And of course, don’t forget about the good folk at Bespoke, who are making it all possible. On my blog, I have tended to focus on monetary policy issues. Indeed the previous post from February 2014 was ominously titled “The sum of all tightenings” (now that I just read it, it turned out not to be a completely bonkers story). Today, too, I will focus on monetary policy, albeit from a more theoretical standpoint. A few years after the crisis, some economists were pondering the idea of raising the inflation target. Most famously, a paper by Olivier Blanchard from 2010 suggests that the CPI target should be moved from 2 to 4% (short summary here). There was also an interesting paper from Laurence Ball four years later advocating the same thing. I remember at the time that the idea was ridiculed by “street” economists and strategists with the reasoning going along the lines of “yeah right, you can’t even meet your current target so good luck with a higher one”. Even the policy heavyweights like Ben Bernanke dismissed the idea back then and we simply moved on. Those of you who follow the markets will be aware that last week Janet Yellen somewhat surprisingly said that the question of raising the inflation target is critical (a nice FT story here). Again, the idea was quickly dismissed, eg by Martin Wolf. In fact, I chuckled to see this familiar argument from the FT View, which entirely misses the point. Again. But the Fed should not be distracted from the theoretical benefits of changing the goal while it has consistently failed to reach the current one. The core PCE has fluctuated around 1.5% and core CPI, while more volatile, has been around 2% for most of the time (except 2015). If someone thinks that from the economic agents’ point of view this is sufficiently far from the target to warrant making fun of the monetary authority then they are mistaken (and that would hold even if we weren’t exiting from the biggest forced deleveraging of a generation). For the purposes of this post, I will therefore assume that the Fed has been fairly close to its inflation target and it has certainly not been a failure of the policy. If you disagree with this, you might as well stop reading. Also, please bear in mind that this argument is about the Fed and the Fed only (not the ECB or the BoJ, whose inflation credentials are considerably worse). Back to the main story, though. Former Governor of the National Bank of Poland Marek Belka was asked several years ago during a meeting with investors in London whether he thought it made sense to lower the inflation target in order to adjust to ever-low inflation prints. He seemed shocked at the suggestion and replied asking why anyone would want a tighter monetary policy at this juncture? Most people in the room didn’t get his point so he went on explaining that lowering inflation target by 1pp is tantamount to a promise that real rates would be durably higher by this amount. In other words, the central bank would have to hike interest rates faster than otherwise. Seems simple but for many this still isn’t straightforward. For some reason, the discussion didn’t move to raising inflation target back then. Assuming the Fed is a credible central bank (and if it isn’t then I am not sure which one is…), there is a possibility that the inflation target gets moved to 4%. In the short to medium term it would be similar to letting inflation run a little bit hot after years of low growth, which the Fed wants to allow anyway but in the long run it would be a significant change. This would mean that the Fed commits to not tightening monetary policy as aggressively as it otherwise would. Would people believe it? Sure they would! Now, the problem these days is reflexivity of markets. For example, Fed hikes interest rates, dollar strengthens, Fed needs to refrain from hiking. All this sometimes happens at a breath-taking pace. Also, we must not forget the Fed’s dual mandate, given that we seem to be at full employment. Therefore, it is safe to assume at the moment that the Fed will continue chugging along with rate hikes for the foreseeable future. Slowly but surely. There is a significant problem here, which the Fed seems to have identified (judging by recent comments from Dudley) – so far the slow and predictable pace of hiking interest rates has not led to any significant tightening of monetary conditions as stocks continued rallying, spreads tightened and the curve flattened. This very much resembles the pre-crisis Greenspan’s conundrum era. The Fed hikes but the market eases thus leading to significant build-up in leverage until things go really ugly. So hiking rates, while appropriate, may prove deathly in the long run given how vast the financial markets have become. the banking sector stays buoyant. Finally, imagine that these two forces, ie rate hikes and an increased inflation target get supplemented by offloading of the balance sheet. What the Fed would then achieve would be bearish steepening of the curve, which in my opinion is the necessary condition for us to finally move on from the aftermath of the 2008 Global Financial Crisis. And if that happens, discussions about the US fiscal stimulus and tax cuts would probably be met by questions like “Donald who?! ?” or “Who cares?”. This is because the economic impact of gradual bear steepening of the curve driven by a higher inflation target would trump (sic!) everything else. *It’s been more than three years since I last posted. I don’t suppose it will take me another three years to write the next one but one should not assume that hereby the regular service resumes. This week one of the German banks (starts with “D” and ends with “eutsche Bank”) decided to enlighten us with their insight into Fed’s communication policy and transparency. 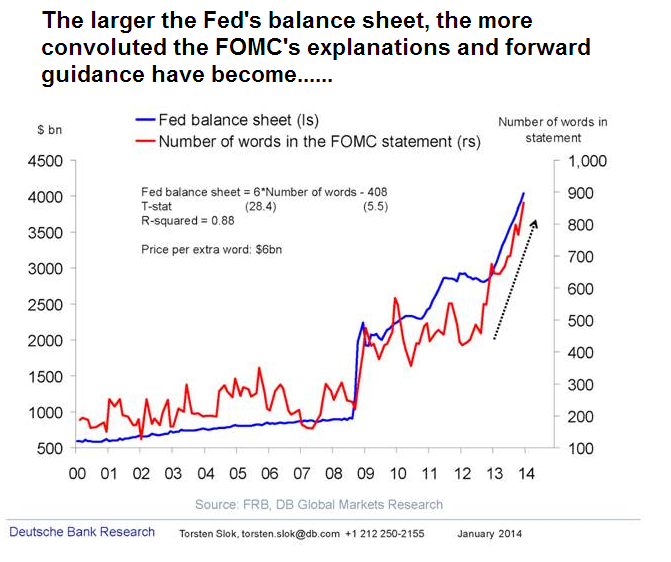 One of their “analysts” has plotted the size of the Fed’s balance sheet against the number of words in FOMC statements. This person has also decided it would be useful to do a regression and inform us that R^2 is very high. There also was an arrow to show joint direction. Reluctantly, I will paste this chart below. And before anyone starts saying I don’t have a sense of humour, let me assure you I get the wit here. Additionally, I will not spend time explaining how absolutely retarded from the econometric point of view this is (on at least five levels). When I moaned about it on twitter I got a few replies including one that says that the chart is “provocative”. Presumably because it points out the fact that the communication policy of the FOMC has been somewhat imperfect. In fact, this sort of criticism is often used against many other central banks, particularly after they’ve depleted traditional monetary policy tools. I profoundly disagree with such opinions and here’s why. The world is not exactly a carbon copy of any Macroeconomics 101 course. In fact, it is a pretty screwed up place with tons of opinions and research floating around simultaneously wrestling with burgeoning financial markets which themselves have become increasingly more random. Sure, occasionally there are chaps who make careers on calling some things right but then it quickly emerges they were one trick ponies (Roubini, Paulson, Taleb, Schiff, Whitney to name a few). And the private sector does reward being right so you can bet that many MANY people in banks, asset managers or hedge funds (including yours truly) are throwing a lot of resources at the problem of forecasting. With average results at best. So if the private sector has significant issues despite using an enormous amount of resources then why wouldn’t the public sector suffer from the same problem? Pretty much no policy maker has never lived through anything resembling what we’re dealing with at the moment. Comparisons to the Great Depression and Japan have their significant shortcomings too. The system is extremely complicated and I am beginning to think that the whole economic analysis has hit a stumbling block similar to the Heisenberg uncertainty principle in physics. Perhaps we could calculate the trajectory of the global economy going forward but we would pretty much have to rebuild the whole world in some other place and watch it. Or, if that comparison doesn’t speak to you then maybe let’s use the Bitcoin example – the cost of mining (electricity) has now exceeded the benefits. So we end up with a combination of intuition and luck, unfortunately. What has been the response of the central banks? Well, they’ve opened up. They started revealing all sorts of (dirty) secrets. It started even before the crisis with all sorts of fan charts. I remember very well when Poland was introducing its own Inflation Projection. The NBP spent considerable amount of time to inform people that this wasn’t a forecast but a projection. In other words, it was a work of a (pretty crappy) econometric model, which the central bank was filling with all the data it found relevant. And obviously, as the data changed, so did the outcomes of the model. And guess what? It turned out things have changed and central banks reacted as they saw fit. The classic example was the decision not to start tapering in September. But for some reason, people started screaming that this means the Fed has lost the credibility. Sure, the Fed has lost the credibility rather than those who came up with the cretenic #septaper hashtag in the first place. The same kind of thing happened with #dectaper and again, the Fed’s communication policy was to blame. Ok, feel free to argue that the FOMC made a series of mistakes in their assessment of the economy but for crying out loud do not say their communication policy was incorrect because that just goes against any logic. I have this rule when analysing central bankers’ comments. When they talk about current month’s decision, I listen no matter what – after all, they are the ones pulling the trigger. When they talk about what they think they will do in the next 1-3 months, I take that into consideration when doing forecasts. And if they talk about anything beyond the next three months I just go to make myself a coffee. Sure, it might be interesting to read what they say but the disclaimer here is simple: They.Don’t.Know. I have previously been saying that it would appear that the global cycle is turning (growth wise). Or at least so the consensus has it. On the one hand, this should feel exciting. After all, we will be finally able to do the opposite of whatever it was that we have been doing during the cycle that is allegedly ending. On the other hand, however, it is obviously terribly difficult to catch the right moment to do so (some will tell you this is when you should use options but unlike some fat-tail loving people I actually find options pretty expensive, for the most part. But I digress). Firstly, there are strong indications that the fixed income is in the bear market. And modus operandi in any bear market is to sell into any rallies. So, we should simply be short any bonds and/or paid in rates. And I am generally on board with this strategy, except it is so remarkably costly. Curves are exceptionally steep and going short bonds means that we have to be prepared for oftentimes monstrous roll-down working against us. You think US 10y ends the year at 3.40-3.50%? Well, I have bad news for you – this means you should actually buy them! This was completely different when yields were falling. Sure, there always were more or less significant pullbacks but the carry was always with you. I had a look at the attribution of 2013 P&L from J.P. Morgan’s GBI-EM Global Diversified index today. Turns out that if you put your money into EM debt last year and kept it, you would’ve lost 6.33% due to the change in price (i.e. yield going up) but you would’ve made 6.31% (sic!) in coupons. Almost flat in the annus horribilis for EM debt! On top of that of course you would’ve lost 9% on the FX but that’s beside the point. Making money in the fixed income bear market is remarkably difficult: even if you get the broad macro story spot on, you really need to catch small moves and close the position quickly. You don’t want to chase the market after it’s sold off but you won’t fade the move either as it goes against the big trend. The second example I wanted to give is the USD/EM story. Let’s assume for a second that the USD will appreciate from here on in. I don’t particularly subscribe to that view but clearly the first days of 2014 have challenged me quite a bit. The broad USD strengthening is usually consistent with poor performance of EMFX. And boy, there are plenty of reasons to be short some emerging currencies! For example, those of you who follow me on twitter (@barnejek) may have noticed I haven’t been particularly appreciative of the behaviour of the Central Bank of the Republic of Turkey. To quote one of my friends, from the macroeconomic point of view Turkey does appear to be an “unmitigated disaster”. The recent move in USD/TRY is not only consistent with the global USD strengthening but also completely in line with the fundamentals (and no, politics is just a side show). Unless the central bank starts hiking interest rates, I don’t see that trend changing anytime soon. But I didn’t mean to make this post about Turkey and how screwed up the balance of payments situation and short term external… (see? I wanted to do it again :-). All in all, it is very unfortunate that genuine intellectual excitement of something possibly changing quite dramatically is coupled by immense frustration of not being able to put all the trades one would feel comfortable with. I can’t fade the moves, but won’t chase them either. Or was it vice versa…? 1. Will rates in China continue to grow? I disagree with those who think that the only reason behind the EM carnage this year has been the tapering fear. Since the middle of the year the situation in the Chinese money market has been very delicate and dangerous. In the last days the squeeze has intensified which begs the question will China be able to orchestrate tighter money market conditions after the massive build-up of credit in recent years. If you’d like a nice overview of the situation, do read George Magnus’ comment in the FT.
2. Will the renminbi continue to rally? Very few things have been trending in the EM in the last year. Importantly, however, the CNY (or the CNH) has enjoyed a tremendous rally, basically without looking back. Now, in 2014 there are still trade balance related reasons to expect some more appreciation but a one-way traffic in the Chinese FX only encourages the rest of the world to lend money to China, which is against the theme I mentioned in Question 1. 3. Will The Great Rotation apply also to EM? 4. Will EMFX continue to disappoint? The last several years have seen EMFX performing poorly. The reasons were related to shrinking growth differential between DM and EM (and hence equity flows). It does appear, however, that the differential has stopped shrinking so perhaps the EMFX will behave a bit better? 5. Will default risk in EM stay low? With the exception of the usual suspects (Argentina, Venezuela and Ukraine) there haven’t been any worries about sovereign defaults in EM. The underlying fiscal position in EM is quite good so this should not change, unless of course the private sectors (and banks) need bailouts after the big increase in debt in recent years. 6. Will the Terrible Five make it? Brazil, Turkey, South Africa, Indonesia and India have been in the eye of the storm this year. The pressure is still on and the responses of authorities have varied from Rajan’s holistic reform approach in India to Basci’s never ending ignorance in Turkey. In order of fighting chance to make it I go for: INR, BRL, ZAR, IDR and TRY. 7. Will Russia join the Bad Boys Club? There’s been nothing going on for Russia lately. Growth slowing, current account reversing, fiscal situation deteriorating, commodity prices refusing to grow… If it wasn’t for quite low public debt, Russia would be in serious trouble by now. But it is definitely headed in the wrong direction. 8. Will EM be able to “buy more stuff” or will they struggle with disinflation? Mario Draghi says that the current kind of disinflation actually boosts the disposable income, as it is effectively a supply shock. I agree. That said, the risk is that low inflation has set across the EM spectrum, which could really make it more difficult for some of them to grow. 9. Will Central Europe continue to outperform? A forced adjustment right after the crisis has left CEE as the most stable sub-region among emerging countries. Bank deleveraging is more advanced than anywhere else and balances of payments have improved drastically. On top of that growth is really picking up (in a non-inflationary manner, too!). This sets the stage for another year of outperformance but will it happen? 10. Will EU periphery intercept the stream of investments into EM? I know, I know, even Ambrose Evans-Pritchard or Wolfgang Münchau couldn’t say that EU periphery is part of emerging markets already. However, in my opinion they have become a serious competitor for capital against some of the biggest EMs, who have witnessed a dramatic loss in competitiveness in recent years. With global growth increasing, chances are that the FDI pool will rise too. Perhaps instead of targeting Brazil investors will go to Portugal? Or instead heading to Turkey they will choose Greece? These are the 10 things on my mind as far as emerging markets are concerned. And in the meantime I wish you a very Merry Christmas and a fantastic New Year! Thanks for reading the blog and leaving a valuable feedback. Treat this post the same way as you would treat a fat-guy in a pub screaming at the telly when watching a football game. If I ever had a shot at working at a macro HF I am probably about to blow it completely with this post. What interests me the most in such reports is the last column, i.e. the Sharpe ratio, which basically measures the volatility-adjusted returns. As a rule of thumb, anyone consistently below one should not be paid much. As you can see here, most funds are actually below one and the sample is almost 20 years. We will get to the exceptions later. I do realise that trading since the financial crisis has been difficult and the risk-on/risk-off environment has made it very tough to apply any meaningful portfolio strategies but that doesn’t mean hedge funds should not be accountable anymore. Just remind yourself where the name “hedge fund” comes from. No, it’s not a marketing ploy aimed at fooling the audience – hedge funds are meant to make money regardless of the market direction. Instead, these days we seem to be willing to praise hedge fund managers for leveraging bets consistent with the prevailing market trend. And since with the exception of US equities, there haven’t been many trends, the macro guys are struggling. Here’s why I believe the whole industry is failing: the fetish of market positioning. In recent years we have seen a massive increase in focus on positioning data. Things are getting so ridiculous that some investors are taking it to the next level by wondering what the market thinks positioning is. It’s a bit like a “what if he knows I know that he knows” mentality. Consequently, many moves in financial markets are being explained mostly by positioning. Take last Friday – the often-cited reason why EMFX rallied after the US labour data was that people were short rather than the fact that historically good growth in the US has traditionally been associated with good EM performance. Or take the euro over the last year. It doesn’t matter that fundamentals have vastly improved and that the break-up risk is virtually zero. No, the euro has rallied because the market has been short. If you think of it, this is a very convenient excuse for being wrong: “If it wasn’t for people being so short, the euro would’ve surely crashed by now and I would’ve made a fortune“. You can’t argue with that “logic” unfortunately. Interestingly, results for 2013 are still not terrible (although infinitely worse than most of the passive 60:40 strategies). Why? Well, one of Abe’s arrows was golden and pretty much every macro fund caught some of the move in USD/JPY at the beginning of the year. Now they are of course celebrating even though draw-downs since then have oftentimes been eye-watering. But let’s go back to the table. Have a look at who hasn’t fallen below unity. Special situation funds and multi-strategy guys. Special situations, like distressed debt, require a lot of ground work with little regard to global trends. If a company in stress has debt that matures in the next few months, it really doesn’t matter much whether Draghi pushes the deposit rate below zero. Or at least it’s not the most important factor. And multi-strategy? Well, that’s sort of my point. I have no idea what are the exact constituents of this group in CS’s sample but it sounds and awful lot like the diversified market portfolio. Except it costs 2% to run.